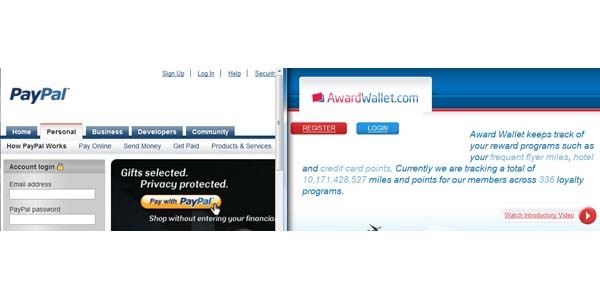 What do PayPal and Award Wallet have in common? Not much really, except for the fact that I’ve been dealing/working with each of these online tools quite a lot as of late. First, let me state that this is in no way a sponsored post. I simply woke up this morning, sat down at my computer and when I began to write, realized that my recent experiences might prove useful to anyone else who spends a good deal of time traveling. Okay, I honestly don’t like PayPal much at all. It’s a pain. Every transaction I make seems to be a hassle, the fees are quite high and I’ve found their Customer Service to be mediocre at best. As a permanent nomad, I always have trouble with PayPal because I am constantly logging in from different countries around the world, which to them seems quite suspicious, and so they tend to freeze my account remarkably often. And by ‘often’, I mean pretty much every time I make a transaction. I’m actually serious as, in the past 12 months, my account was frozen all 9 times I sent money to someone else through PayPal. So, from random places such as Iraq, Syria and Indonesia, I’ve had to call up PayPal and answer a long list of multiple choice questions to prove my identity and have my account restored. And unfortunately, when I’m informed that my account has been ‘restored’, half of the time it still remains frozen and I have to call PayPal and repeat the process once again. After speaking with other travelers, the frequent freezing of accounts seems to be quite a common problem. This is why, when my account was frozen one month ago while in Singapore, I decided that I had had enough. I called PayPal and strongly suggested that they either come up with a solution or else I would take my business elsewhere. Luckily, this time around, I ended up speaking with a very helpful customer service representative who provided me with two solutions that immediately solved my problem. 1. He added a notation on my PayPal account that lists me as a ‘frequent traveler’. This is a similar system to when you call your bank or credit card company in order to inform them that you will be spending some time overseas. PayPal is also working on developing a system where users will be able to go into their account and list the countries they will be visiting in order to prevent PayPal from freezing their account when transactions are made while in those countries. For now, however, if you travel extensively, it might be a good idea to give PayPal a call and have them list you as a ‘frequent traveler’ as well. I’ve now used the Security Key twice and it has worked perfectly, so I’m quite happy with this solution. However, it is important to note that the Security Key seems to be quite a secret. When I had trouble activating the card (it was my fault in the end), I had to speak with four different customer service representatives until I found one that even knew what the Security Key was. So it might take some effort to get one, but once you have it, your PayPal troubles should be over. There I am at my friend’s house in Sydney, Australia, trying to search the internet for a good hotel option for my visit to Perth. After thirty minutes of searching, I don’t find anything that appeals to me much and so I decide to book a room at a cheap hostel instead. However, before completing the booking, I run into the kitchen and make a quick sandwich. And it’s a good thing I felt the sudden urge for this sandwich as, by the time I returned to my laptop five minutes later, I had received an important email. The email was from AwardWallet.com, the online tool that I use to manage all of my Frequent Flyer accounts and rewards programs. They were notifying me that my United Mileage Plus miles were about to expire in one month and if I didn’t use them before that time, I would forfeit the 60,000 miles I had in that account. As I had no need to book any flights, I immediately logged onto my Mileage Plus account and began looking for ways to use my miles to book a hotel room in Perth. Fifteen minutes later I had booked 5 nights at a popular, well-reviewed 3-star hotel in the city center. Had Award Wallet not sent me that email, I would have never known my miles were about to expire. Sure, United would have sent me their own notification but they typically send me 3-5 junk emails per day, all of which I delete immediately without reading. This is why I find Award Wallet to be a nifty organizational tool that is very useful for anyone who is constantly traveling and trying to benefit from Frequent Flyer Miles at the same time. Whenever I need to book a flight, I simply log-in to Award Wallet and right there, on one page, it shows me how many miles I have available to use for each airline program of which I’m a member. Also, whenever I fly somewhere and earn miles, Award Wallet receives that information from the airlines and automatically updates my mileage balances in my Award Wallet account. And, of course, the notification emails are an excellent bonus, especially when the possibility of losing 60,000 Frequent Flyer miles turns into spending almost a week in a mini-suite with a view of Perth’s Swan River instead! Do you use Award Wallet or PayPal’s Security Key? How has your experience been? I used my UK Paypal account from abroad for many years without any problems whatsoever. Then about two years ago I also started to get my account frozen for just about every transaction. Even payments to people that I had made dozens of payments to before were blocked. I had also heard about the usefulness of security keys but whenever I tried to order one I was told I couldn’t do it while abroad. I recently got back to the UK after 8 years away and couldn’t believe it when I was once again blocked from ordering one. I persisted and eventually managed to get one after contacting them and complaining that they were limiting the security of my account by not issuing one. I also took the opportunity to remind them of the number of times I had received emails from them stating that “Paypal takes the security of your account very seriously”. My experience over the last couple of years with Paypal customer service has been that they can only help with minor issues, and instead of referring you to someone higher up they will spin you a load of old tripe just to get you off their backs or just bluntly tell you that they have done all they can and that there are no additional options available. Often, I never received a reply at all. In all the time I had problems with Paypal I never once was advised to apply for a security key. Nor did anyone there offer to list me as a frequent traveler despite me mentioning multiple times that I am always traveling. Hey Earl, I was just wondering if all is going well with your security key? Still no more account freezes after all these months? I’m hoping that’s the case. That’s great news to hear that you are still having no problems with it. Keep up the great work, and lifestyle!! thanks for the report on paypal and award wallet. i recently have had my card blocked several times by PP. so I called them as you suggested, today, and got added on my account frequent traveler. i signed up for the security key, but had to pay, the 29.95. also useful information was given by the attendent- said to go to profiles in PP and click on vacation plans. can put in for vacation countries from now and to from a year from now. so i entered brazil starting this monday (where i live a lot) until may 2012) so lets see if this all works, as well as getting cash from my bank, i get SS and have that money sent to me through PP. Hey John – I appreciate you sharing that information. The last PayPal representative that I spoke with did tell me that they were working on that ‘vacation notification system’ but I wasn’t aware that it was now up and running. That should make a huge difference…hopefully! And it’s funny about the $29.95 charge for the security key. Some people seem to be charged that amount and others are not. I’m not too sure how they determine which customers have to pay. Seems to be a bit random. We read quite a few rants about Paypal but we have been lucky so far and had no problems but once in Guatemala, where we couldn’t sign in at all. Still like the concept of Paypal and how easy it makes global transfers. AwardWallet sounds great, we had not heard of them until they got in touch with us recently for a review. Now that we read how much you benefit from it we definitely need to sign up for it! @Globetrotters: Lucky indeed! You may be the only travelers never to have had your PayPal account frozen! And definitely take a look at AwardWallet.com. Not only is it a useful tool but their staff are very helpful as well, which is something I always look for. Have you considered using the Pay Pal Debit Mastercard? It claims to have zero foreign transaction fees and no ATM fees. Money can be taken directly from your Pay Pal account or pulled from a back-up source if the Pay Pal funds are gone. Plus it offers a 1% rebate on all “signed” purchases. Just curious if this has worked for anyone? Hey Darrin – Thanks for the comment! I have heard about the PayPal Mastercard. But given all the hassles that myself and many others have with PayPal, I don’t really want to link anything else to them. The last thing I would need would be to have that card account frozen while I’m somewhere in the world. And so far, the Capital One credit card (which doesn’t have international transaction or ATM fees) has worked perfectly for me! Hey Ryan – Definitely check out Award Wallet. It’s a quality tool and requires nothing but a quick registration to get started. And it doesn’t cost anything either which is of course a bonus! Yup Paypal is a nightmare travelling – I did a trip around Europe and a few weeks in Asia a few months ago. I was working while I travelled so I HAD to have access to paypal – I contacted them and told when and where I was going to be. But every time I changed countries I had to go thru the usual nonsense of security questions – changing passwords etc etc. The problem is that I almost ran out of security questions – most of them I have no answer for – who was my first teacher at “elementary school” – who knows that??? I’m going to check out and see if I can get the security token from them – its similar to what my bank uses and it works great! Hey Lissie – The security token should solve your PayPal issues. Hopefully it works anywhere and completely eliminates the chances of having one’s account frozen. So far I’ve only used it from 2 countries, but it looks quite promising! For logging into Paypal: If you have an iPhone, you can also download and use a free app called “VIP Access” by VeriSign. It uses the same SecurID technology. You simply register the unique “Credential ID” (it shows up when you launch the app) with Paypal and when you login, you use the Security Code that appears in the app (it refreshes every 30 seconds). It’s not that tough to find the Security Key section of your Paypal profile. Once you’re there you can hunt around for the place to register your own security key. Thanks for sharing that info about the iPhone app Raam. Seems like another good option that would save a lot of potential hassle. Now I just need an iPhone! I’m one of those who has had issues with PayPal & donations. I think I found a work-around with GoFundMe.com Still uses a PayPal account. Additional % taken off, but if that means my account won’t get closed, it’s worth it! Hey Matt – That’s good to know about GoFundMe.com. I’ll have to check that out as I briefly looked at CrowdRise.com and have been looking for other options as well. Glad to hear you ordered the Security Card. I find it strange that PayPal doesn’t advertise this service much. Seems like it would help save PayPal quite a lot of phone calls and time spent dealing with customer issues. I can’t complain personally about PayPal, but can definitely attest to the usefulness of Award Wallet. Mainly because I’m lazy and prefer the one password thing. Excellent recommendation! Hey Stephen – I’m with you….anything that reduces the number of passwords I need to have or remember is worth a look to me! It’s good to see you managed to get one of those key cards from Paypal. As you know I’ve just been using the message center, and finding it okayish. But, not had a blocked account for about two years. But, when I did, it was fairly nightmarish alight. Out of interest, it would be interesting to see if this security card will be available worldwide, or only for USA residents? I say this as when in West Africa PayPal only offered limited accounts, at that time. It seems like each country has it’s own terms and conditions. India for example and last years cut off fiasco. I for one would like one of those security cards. When based somewhere I’ll give them another call and see what happens. But yes, a monopoly is never good thing! Thanks, for the shout out too by the way. Appreciate it. Hey Dave – Naturally, it is almost impossible to find out on PayPal’s help pages who can actually get one of these Security Keys! However, it appears that citizens of the US, Australia, Canada, the UK, Austria and Germany are all eligible. One option, while somewhat of a pain, is to have one sent to someone you know and if you need to make a transaction, they can always press the button, generate the code and give it to you, wherever you are in the world. It’s not an ideal solution but better than a frozen account. useful post thank you. I dont travel and live in locations like you do, but I do use paypal a lot, so this is good to know. I think I will get the security card anyway. I really like that idea. Hey Gary – It definitely doesn’t hurt to have that Security Key. It seems to be a good way for everyone to avoid PayPal issues! I see that I’m not the only person that has had frustrating problems with Paypal. While in Nepal last December, I tried to help out a nice family that feeds and educates children by paying their website fee with Paypal. They froze my account. I sent a lengthly e-mail to them and got no response back. I’m still trying to get the situation straightened out. It’s unfortunate we don’t have more choices of payment processors. Some competition would be just the answer to crappy service. Hey Don – You’re definitely not the only one with such PayPal issues, although your situation does seem to be dragging on even longer than most. It’s incredible that you’re just trying to help a family out and PayPal could care less. I agree with you that it’s a shame there aren’t any other realistic options at the moment. What a great day it will be when some real competition does arrive! Ahh… Paypal.. it seems to be a necessary evil in these times. This is why Monopolies are bad… you have this one giant payment processor everyone is using and it doesn’t matter how bad their customer service is. Hey Nick – You are absolutely correct. I just find it shocking when any company doesn’t realize the value of customer service, no matter how big they are. Just imagine how much more positive this post and others like it would be if I felt PayPal cared a little more about my business. Instead, I use their service it less and less each month. Thank you. Very informative. I have yet to have my account frozen (knock on wood), but it is good to be well-prepared just in case. Hey Tijmen – It’s really a shame that PayPal’s customer service is so bad. Being a little more helpful doesn’t seem like too much to ask and it would certainly help change their image as well. And let me know what you think of Award Wallet….it really is a great tool! Paypal really is kind of a pain. They froze our account after getting donations for our Yakezie Scholarship. We ended up changing the name to Yakezie Writing Contest b/c Scholarship denotated something else. Either way, I’m fine with it, but it is a pain. Speaking of which, we’ve launched our latest Yakezie Writing Contest! @Yakezie: I’ve heard several people mention problems with PayPal when it comes to accepting donations. They have some strict rules as to where the money you receive can be used (which to me doesn’t really seem like PayPal’s business). But they make the rules of course. I have never used PayPal for anything. Though I’m curious what all is it good for and is it the best thing to use as a traveler? Also, I forgot to ask last post, how long are you planning on staying in Mexico this time around? Hey Ozzy – PayPal is a good solution for sending and receiving money to other people all over the world. For example, I used PayPal to pay the web designer who re-designed my site because he is in Australia. There really is no other way for me to send him money so with the click of a couple of buttons, I send money from my PayPal account to his and he can then deposit that money in his bank account. Also, many websites accept PayPal as a form of payment as well, giving you another option in case you lose your credit cards while on the road! And I’m not sure how long I’ll be in Mexico this time around. I have a few small trips in the near future but I should be here on and off for the next few months. Timely post on Paypal. We’ve tried numerous times to talk to them today to let them know about our upcoming travel, but we couldn’t get in touch with any live person. Next time we do though, will def tell them to leave that notation on our account. Thanks for sharing! Hey Jill – It’s worth it to give them a call. And that’s interesting about not finding a live person to speak with. I normally get a live person but they might as well be a computer considering how unhelpful they tend to be!